The Vancouver Condo Buzz » 100 Homes Under $169,900! Landmark Prime on the Plaza Surrey Micro-Lofts for Sale in Downtown City Centre > Prime Surrey Micro-Condos Now Selling! The Prime on the Plaza Surrey landmark condo development is situated at 103rd Avenue and University Drive Surrey where you will find a unique offering of micro-lofts in this very central location. 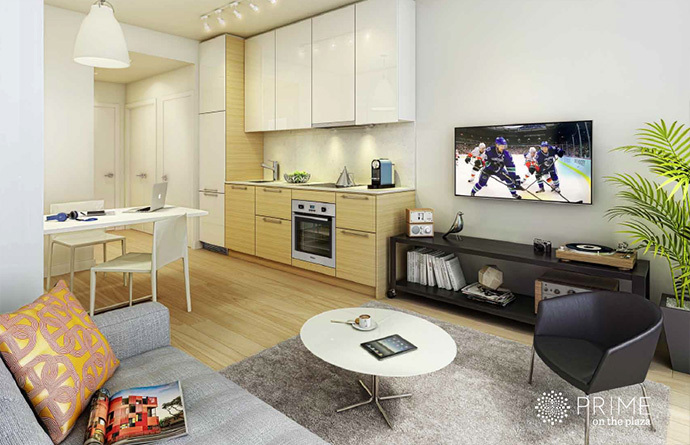 The Surrey micro-lofts at Prime on the Plaza condo tower is brought to you by award winning master builder Reliance Properties who have long been known as the pioneer in compact living innovation in both Gastown Vancouver and downtown Victoria. 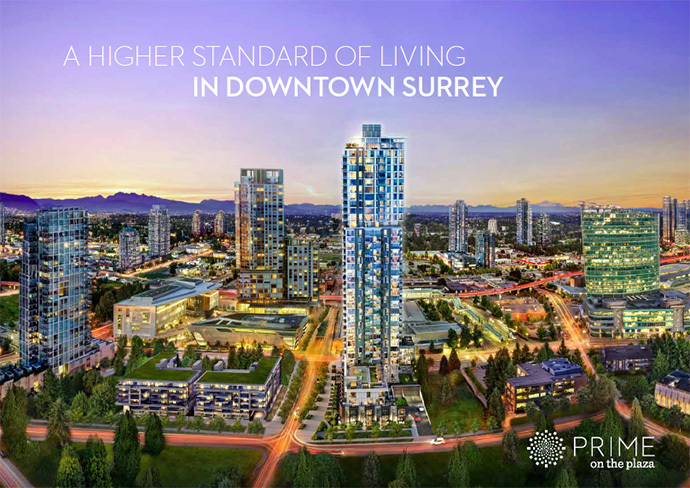 The landmark Surrey Prime on the Plaza condo project will feature a 37 storey iconic high-rise that will offer over 370 condo residences and downtown Surrey micro-lofts for sale. These range in size between 291 square foot studio layouts to 1,172 square foot three bedroom family sized condominium homes. This gives a great breath of opportunity for any homebuyer or investor looking for a central Surrey Downtown condo to purchase. In addition, the master planned landmark Surrey Prime on the Plaza condo development will feature many on-site amenity spaces that includes a fitness centre, music room, multiple meeting rooms, a spectacular roof top deck and entertainment space. The Prime Surrey micro-lofts start from an incredible pricing point of $139,900! 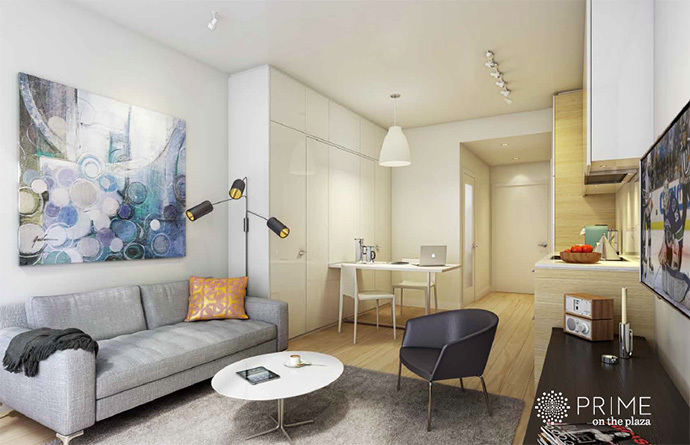 The 2 bedroom corner suites will start from just $329,900. The great location is kitty corner to Surrey Civic Plaza and just steps away from SFU and the SkyTrain to Vancouver. The downtown Surrey micro-lofts is a very innovative advancement in making property more affordable for first-time homebuyers. 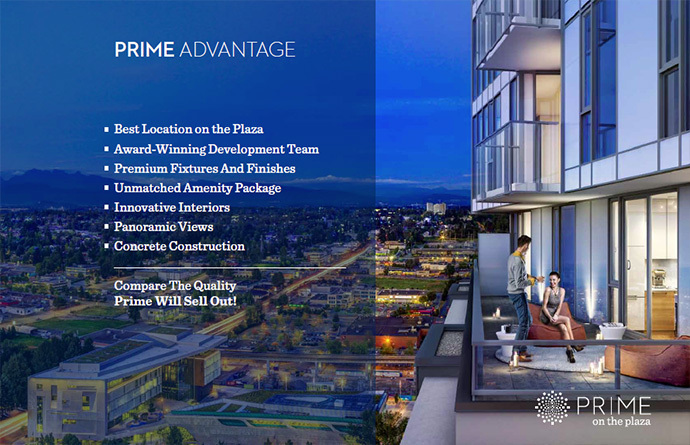 For more information about the new Reliance Properties Prime on the Plaza Surrey downtown micro-lofts and condos, please visit www.liveprime.ca for more details! It’s time for Prime! 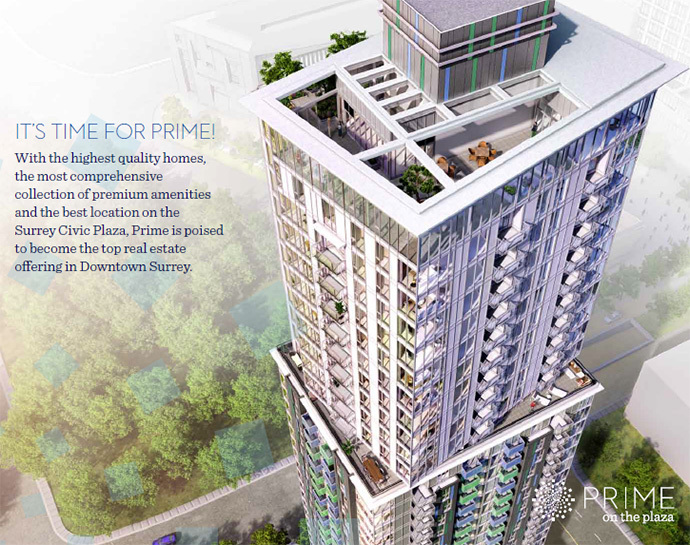 According to their latest marketing brochure: With the highest quality condominiums, the most comprehensive collection of premium 5-star amenities and the best location on the Surrey Civic Plaza, Prime Surrey condos for sale is poised to become the top real estate offering and investment choice in Downtown Surrey’s real estate market place. Here are some of the amazing advantages of owning at the downtown Surrey Prime on the Plaza high-rise tower: it has the best location in the Plaza District, an award winning development team, premium fixtures and finishes that unparalleled in this market, unmatched amenity spaces, innovative and functional interior spaces, panoramic views and concrete construction that will last a lifetime. Some of the other amazing features of the master planned Surrey micro-lofts for sale include a comprehensive unit and floor plan mix that are both functional as well as efficient in addition to multiple outdoor terrace spaces that have rooftop gardens with kitchens. There is a resident manager and concierge/security desk. The interior features of the new Prime Surrey micro-lofts and condos include oak finish cabinetry, custom designed storage millwork, custom wall bed/dining unit for the new Surrey micro-lofts, junior one and micro two bedroom suite floorplans, polished composite stone counters, European style fixtures and wide plank real wood engineered flooring. As well, there is an included flat screen TV. The amenities on-site at the downtown Surrey Prime on the Plaza condos and microlofts include: a fully equipped fitness centre, wellness yoga studio, massage room, sauna and steam room, music and study rooms, entertainment rooms with kitchen, spectacular podium roof garden, full equipped business centre, meeting/group study room and a rooftop patio that has a full kitchen, large dining room, cocktail lounge, outdoor BBQ, landscaped garden, open terrace and stunning 360 degree mountain, ocean and city views. The Prime on the Plaza micro-lofts and condos are situated directly across from Surrey Civic Plaza and will include a wide variety of micro-lofts, one, two and three bedroom floor plans. The Prime on the Plaza Surrey pre-construction micro lofts are across from the North Surrey Rec Centre and within a short walk to the Surrey City Hall, Library, Surrey Central SkyTrain Station, SFU Surrey Campus and City Centre Shopping Centre. The interiors will feature high ceilings, wide plank real wood engineered flooring, high efficiency low-E windows, Euro style combination wall bed/dining unit with built in LED lighting in the new Surrey micro-lofts, junior 1 beds and micro two bedroom suites. There is also custom designed storage millwork in all homes. The kitchens at the Prime on the Plaza Surrey pre-construction microlofts include European style faucets with pull out spray, stainless steel under mount sink, polished composite stone counters, Euro style integrated appliances and rift cut oak finish veneer millwork and cabinets. The beautiful bathrooms at the pre-construction Surrey Prime on the Plaza condos include obscured glass entry door, obscured glass bathroom and closet wall in select floor plans, honed large format marble tiled floors, glossy ceramic wall tile and polished composite stone counters. The bathrooms will also feature frameless glass shower enclosures, custom designed vanity light in select homes, custom designed vanity storage, rift cut oak finish veneer cabinets and European style polished chrome faucets.